Manila's King of Nightlife Louie Ysmael adds a rooftop jazz lounge to his directory of nightspots in the metro as he opens Top of the Alpha by Louie Y. As the newest premier jazz bar and lounge in town, it features all genres of jazz, performed by Manila’s finest jazz bands and talents plus acclaimed foreign artists, right in the heart of the lively Makati Central Business District. Top of the Alpha is the perfect spot for jazz lovers as well as those who simply need to unwind at the end of the day with a few drinks, good food, and a spectacular panoramic view of the metro from The Bird’s Nest, the lounge’s outdoor wraparound seating area. From the classic nightclub door canopy entrance at Alphaland Corporate Tower, a private elevator whisks you up to the penthouse floor, home to Top of the Alpha, and there’s also an express elevator from the 5th floor of The City Club. 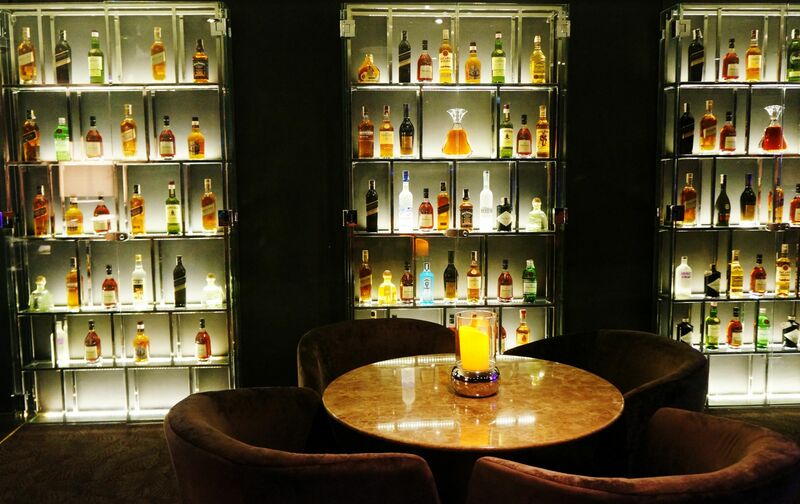 Once you step out of the lift, the warmly lit onyx bar, fully stocked with fine liquor, and plush seating beckon you for a drink. The walls of windows allow glimpses of the twinkling lights of Makati, adding to the special ambiance, while the walls are lined with pictures of the world’s greatest jazz artists, and all the premium liquor brands. The Piano Lounge, with a sleek, black grand piano and band set is complemented by a striking backdrop of waves of holographic walls. You've been known to open the biggest and hottest nightclubs and discos and now you're on to a new venture. How did it all start? And why just now? Louie Ysmael: Jazz has always been my favorite type of music since my teenage years. I was exposed to all kinds of genres of Jazz when I was at school in USA. The reason for going into this business by starting with disco & dance club was because of the type of music popularity in the 70s and 80s when I decided it was a good time to introduce Manila to the dance club scene. I have since evolved to more progressive club music as I moved along in the business through the years starting from Stargazer, Louie Ys, Pare, Euphoria, Vencia, V-bar, Nuvo, Members Only, Opus, Prive, and recently The Palace which houses Xylo, Revel and The Island, Yes Please and BAD. This particular venture Top of the Alpha was offered to me by Mr. Bobby Ongpin -- Chairman, CEO, and Director of Alphaland Corporation. After studying the location and the configuration of the space. I decided that it would best suitable for a Jazz lounge. We improvised in the space, included three beautiful private rooms where you can observe the bands through the large TV Monitors or listen to your own choice of Jazz music from our selection of over 10,000 jazz songs of all genres. Where did you get the inspiration for the interior design of the place? What kind of nightlife experience would you want the guests to have? It has a cigar divan, featuring finest Tabacalera cigar and a wrapped around terrace with a spectacular view of the metropolis. The venue was beautifully executed by the very talented Alphaland resident architect Enrico Sison with whom I gave my inputs and inspiration on this one of a kind experience anybody is sure to enjoy. We are presently working on importing the best foreign Jazz band into the country. We should be able to commence their series by January of next year. What do you think about the Manila crowd's reception of this music genre? Most especially the younger generation today (25 to 35 y/o)? Hopefully Manila’s younger generation will appreciate what we are doing and learn to love which I consider the mother of music which is Jazz. Jazz comes in different genres such a avant-garde, acid jazz, contemporary, crossover, smooth, Bossa, fusion, mainstream Jazz. What do you feel now that finally you opened Top of the Alpha? I’m quite confident that our venue will add to an additional plus to entertainment choices here in Manila.